Thank you Andye @ Reading Teen, for sending me this for an honest review! I looked forward to Exile mainly because it's about music (even though I'm really not the music type). In the synopsis, it mentions a mystery and a secret: two things I really enjoy reading about. Unfortunately, Exile was a huge disappointment. From the start, Exile couldn't hold my interest. It was painfully boring, and nothing interesting was happening. I started to lose more and more interest and multiple times I wanted to stop reading altogether. I heard positive things about this though, so I continued on with hopes of enjoying this more (I didn't). Summer was not a likable character. She's a band manager who just got left behind by her former band when the said band got signed by a record label. She went out with one of the band members, only to find out that he's been cheating on her because "I couldn't help it. They were so into me. It was hard, you know?" Summer regrets hanging out with the band so much because without the band, she doesn't have any friends. Basically. But as she's looking for a new band, she instantly falls in love with Caleb, who got left behind by his band. With relationships, I like the romance to build up. There was no building up here. They got together too soon and I never felt the love between them. Why are they even going out? It was so hard to connect with both of them, because Summer was her annoying self and Caleb didn't have much of a personality. The pacing was too slow for my liking. I kept waiting and waiting for something exciting to happen. But I did like the twist. That is probably what I liked most from Exile because the mystery, finally! I guess you could say that it's the mystery that pushed me to the end, and made me rate this two stars instead of just one. But the mystery brings in a new character, Val, who I did not like reading about. 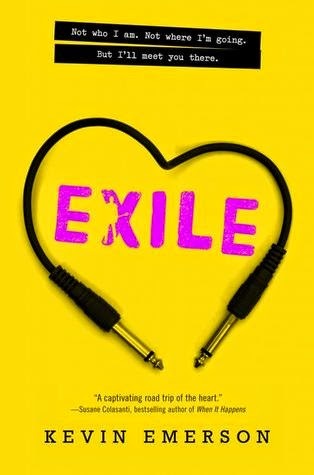 Overall, Exile turned out to be a major disappointment. I disliked the characters and majority of the plot. Because of that, I won't be continuing with this series. I honestly don't think this should be a series, because I can't see this going on much further. Exile is fine as just a standalone. I won't say I don't recommend this, however, because even though this didn't work for me, it could for you. Thanks for the honesty! I've seen mixed reviews of this one, and although it does seem sort of interesting it has never really caught my interest. I think I'll skip it. Probably a good idea on my part judging by your review. You're welcome and thanks! :) I really wanted to like this one but it just wasn't for me. This one sounds like a disappointment. Slow pace and characters you don't like are kind of deal breakers for me. Mhm, definitely. That's exactly why I couldn't get into this. It does pick up a bit later on, but by then it's already too late. Dang, sorry you didn't care for this one too much! I guess I'm not too sad I let it go...haha! :P Thanks so much for the review!